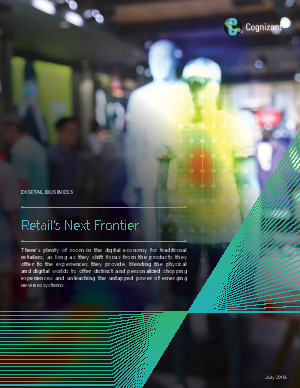 There’s plenty of room in the digital economy for traditional retailers, as long as they shift focus from the products they offer to the experiences they provide, blending the physical and digital worlds to offer distinct and personalized shopping experiences and unleashing the untapped power of emerging new ecosystems. At the heart of retail’s ongoing transformation is a shift in focus from the point of sale to the point of experience. Retailers that will thrive and prosper in the digital economy will be those that think beyond the products they sell to providing hyper-personalized shopping experiences that surprise and delight the consumer at each interaction, regardless of channel or touchpoint. This white paper illuminates these strategic imperatives and delivers actionable recommendations to established retailers seeking to convert challenge into opportunity amid growing concern that they should merely concede victory to digitally-native companies.